With summertime upon us and people from far and near wanting to get outside, the time is right to share some cool bars and restaurants we’ve come across lately for craft beer lovers. Yes, the longtime favorites such as Mekong, Birch Bar, Space Bar, Bier Garden and countless others are still going strong and are maintaining their excellent beer lists and food pairings, but we’d like to take a moment to inform readers of some fun recent additions and unique destinations to our craft beer culture. 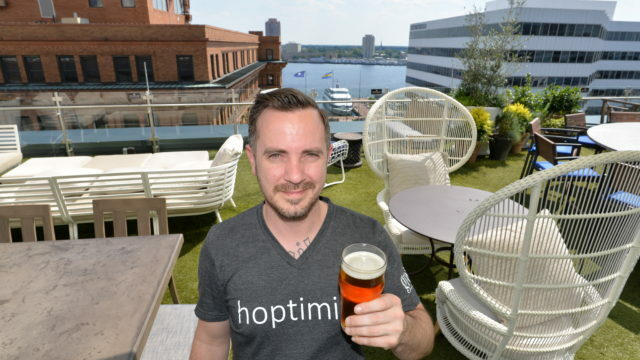 Arguably the most impressive space in all of Virginia to enjoy a beer, Grain is located on the 5th floor of downtown Norfolk’s new The Main, a chic, artistically designed architectural gem created by Virginia Beach developer Bruce Thompson under the Hilton flag. Grain is one of three restaurants, each with a different big city vibe. Visually, Grain is impressive in every way with two open air, outdoor patios. The front patio includes ample seating with tables, a large gas fire-pit, artificial green grass, trees, and lights with great views of the surrounding buildings and the Elizabeth River. The rear patio also offers nice views of buildings and Granby Street. This area is also a gaming area with a large, outdoor chess set where players sit atop opposite lifeguard-style seats. The interior is ultra-contemporary with a supersize fireplace, comfortable leather seats, a large 3-sided bar, and nearly 100 beers, ciders, and wine on tap. Grain is keen on offering beers from Virginia. Stockwell said fruited ciders are a big seller as well. “Whenever you bring in a fruited cider, whether its pineapple or blood orange, that’s really big,” he said. Port City’s Optimal Wit is currently Grain’s most popular selling craft beer. Grain is big on huge tap takeovers. Green Flash, for example, will take 24 of the taps for a one day event. Bruce Thompson, the hotel developer, is hands-on with his approach to every small detail of the operation. Thompson wants Grain to be known as a beer destination. The Waterside District is downtown Norfolk’s brand new, hip venue on the banks of the Elizabeth River featuring live entertainment, dining and lots of beer. While there are anchor chains such as the Blue Moon Taphouse, PBR and Guy Fieri’s Steakhouse, the Cordish Company made sure to accentuate local ingredients such as Cogans Pizza and Norfolk Coffee & Tea. As you enter the main entrance on the first floor you’ll be delighted to see Starr Hill Market Bar in the center of the common space. That’s right. 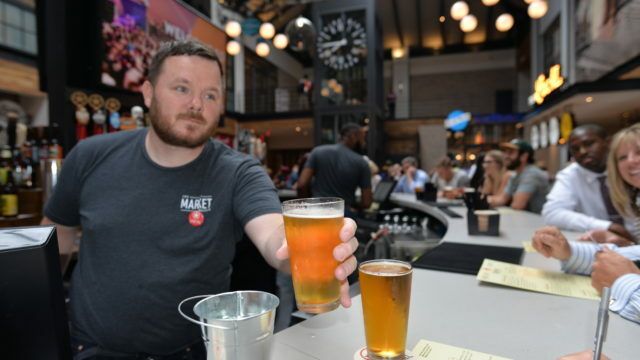 The attractive circular bar is all about craft beers from Virginia. The Waterside has a fun, upbeat vibe. It’s kind of like being on vacation but close to home. A Disney World-like experience for food and beer lovers. HofGarden is one of the newest additions to the Scott’s Addition neighborhood in Richmond. It opened in early May 2017 in a building that is described by The Department of Historic Resources as a rare example of “exotic revival style” architecture. The building originally was home to Hofheimer Fine Rug Cleaning and later Adams Camera Shop. More recently, the space was used for private events. 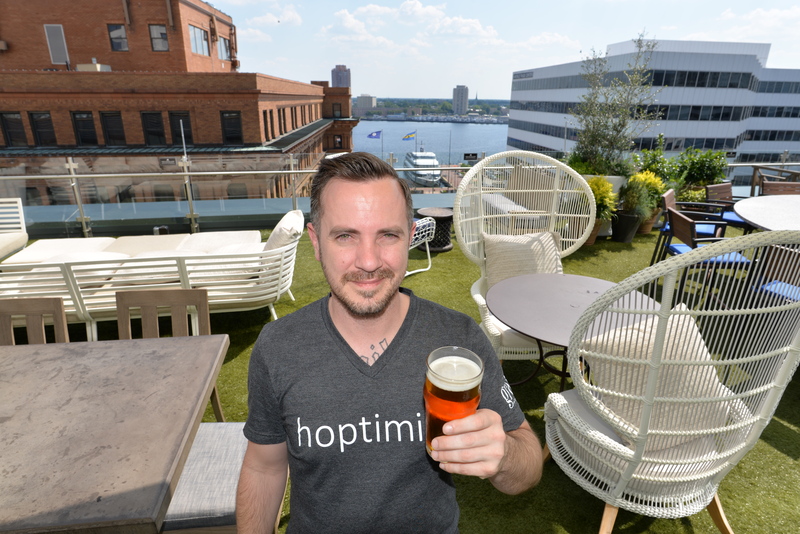 Then, earlier this year, owners Carter and Annie Snipes converted the building to a Bavarian rooftop Biergarten and taproom located on the first floor. The name HofGarden pays homage to both the Hofheimer name (a Jewish family surname in Germany) and the Hofgarten (Court Garden) in Munich that sits between a former Bavarian palace and a large urban park. General Manager, Bobby Kruger, says that “We really want to create a biergarten. We love that vibe – casual and fun. 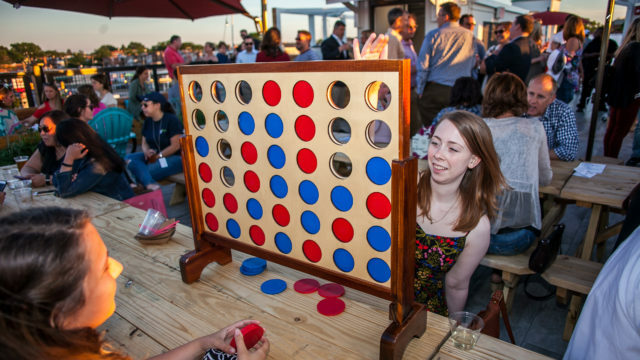 We want people to come and be able to have fun in a lot of different ways.” Having fun is easy here with pub games such as shuffle board and foosball plus darts and maybe air hockey on the way in the taproom and Connect Four, Giant Jenga, and other board games on the roof. The venue also hosts yoga on the roof on Mondays, live music, salsa, African drum circles, and Burlesque. In terms of beer, the emphasis is on both European beers and Virginia craft beers. There are fifteen taps on the roof and nine taps in first-floor tap room. The taps are split 50/50 between European beers and Virginia beers. Wine and cider are also available. German fare such as Grilled Bratwurst or Knackwurst, Baked Pierogis, and Rotkohl (cabbage & apples) are available in “u-boats” – perfect for sharing! The HofGarden is open seven days a week, Monday – Friday 4-11pm and Saturday & Sunday 12-11pm. Jack Brown’s Beer & Burger Joint has been a staple in the craft beer scene in Virginia since opening its original Harrisonburg location in 2009. It’s the creation of childhood friends Aaron Ludwig and Mike Sabin. Now, there are a total of six locations (Harrisonburg, Norfolk, Richmond, Charlottesville, Roanoke, & Elkton) across the state. All of the locations feel as if you have just walked into a vintage flea market, but with an amazing craft beer selection with over 100 craft beer available in bottles, cans, or on draft. They do a good job of offering all styles of craft beer – from local favorites to rare to find beers from around the world. And, of course, all offer the delicious, award-winning 100% Wagyu beef burgers that we all crave after a few beers not to mention the fried Oreo belly bombs! In addition, each location as its own outdoor seating – some smaller than others but none-the-less outdoor seating that adds to the experience. Check individual locations for hours of operations and special pint nights and tap takeover events. Josh Hunt and John Woodriff, the brothers who created Beer Run, Charlottesville’s only craft beer and wine bottle shop, draft bar and full-service restaurant, have hit a home run again with Kardinal Hall. 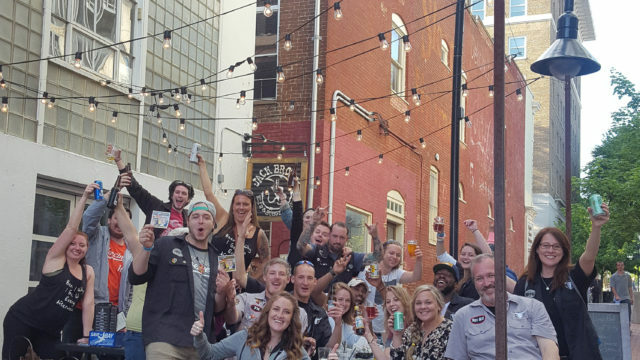 Their travels to other beer gardens in the United States and Europe inspired them to bring their own version to Charlottesville. The Alpine inspired beer hall and garden is located in the 1930’s art-deco Coca-Cola building in the Midtown area of Charlottesville. The large open space both inside and out is perfect for gathering with friends and family. The outside space features two oyster shell bocce courts and a play area for kids. Inside, you will find board games and ping pong table. The beer selection is a mix of German/Import and American/local craft. The taps feature twenty-four draft beers, two wines, one hard cider, and one Kombucha. They dedicate a third of their taps to Virginia breweries. Hunt says, “We are incredibly lucky to have such a vibrant local & regional brewing scene, we always dedicate a third of our 24 taps to Virginia breweries. We also maintain a consistent collaboration program with local & regional breweries and host events for the collaboration releases.” A few recent Virginia collaboration beers include a Pacific Rim Hopped Amber Ale with Blue Mountain Brewing and Beer Run called PR Job, which benefitted the UVA Cancer Center, Iron Leaf, a Strong Belgian Golden Ale with lemongrass, brewed with Pale Fire brewing and a Blood Orange version of Brothers Brewing’s Admiral DIPA, dry hopped with mosaic hops. The food menu uses locally-sourced ingredients and features a modern twist on Alpine inspired pub fare. Kardinal Hall is open Tuesday-Thursday 3-11pm and Friday-Saturday 11am-midnight and Sunday at 11am-10pm. 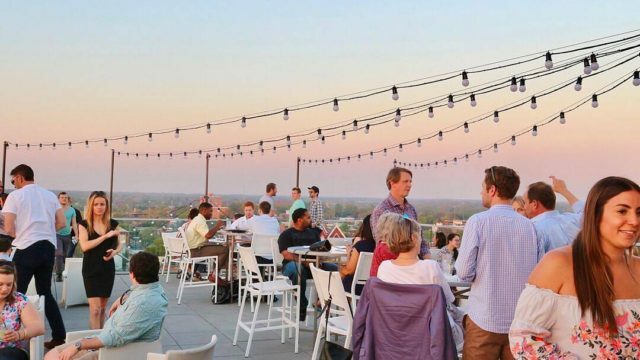 Q Rooftop Bar is located on top of the Quirk Hotel in the Broad Street Commercial Historic District in Richmond. The building was originally the J.B. Mosby & Co., a luxury department store built in 1916. The hotel, which opened in September 2015, is part of Two Roads Hospitality, but it is locally owned and operated. The split-level rooftop bar provides a beautiful view of the Richmond skyline. Hotel guests and locals alike can relax on the comfy couches, tables, or high-tops. The bar features 6 taps – all Virginia craft beers (current selections include Trapezium, Ardent, Hardywood, Midnight Brewing) and a few can options including Buskey Cider. Plans for brewery tap take-overs and special industry nights are in the works. The food menu is described by Bar Manager & Rooftop Supervisor Rachel Sargent as “elevated street food” such as hot dogs and tacos. All include locally sourced ingredients and are house-made. Q Rooftop Bar is open seasonally, weather permitting April – October. Voted Best Bar in Loudon County, MacDowell’s Brew Kitchen is a beach and craft beer lover’s dream come true. It features four bars with different craft beer selections at each bar. Plus, there’s a gigantic outdoor space, “The Beach,” featuring sand, picnic tables, fire pits, and a tiki bar. You would never know that you are in downtown Leesburg and not the beach. What’s not to love?! MacDowell’s Brew Kitchen was created by Gordon MacDowell and Nils Schnibbe in 2011 and has been growing ever since. There are over 150 craft beers from Virginia and across the country available throughout the restaurant and outdoor bar. Their food menu includes BBQ, American pub fare. Live music, comedy and trivia are featured throughout the week and Thursdays feature Tap Takeovers from both local and faraway breweries who bring 5-6 brews to taste. Happy Hour is Tuesday – Friday with 50% off select appetizers and $2 off all draft beer, wine by the glass, and liquor drinks. MacDowell’s Brew Kitchen is open Wednesday & Thursday 4-10pm; Friday 4pm-2am; Saturday 11am-2am; and Sunday 12-9pm.